Despite their financial importance, the beauty industry in general and the cosmetic industry in particular remain two of the most understudied subsectors of the American economy. In terms of cosmetics, for example, each year, women in the United States spend over $10 billion on makeup and associated items. The size of the industry notwithstanding, cosmetics has been the subject of little or no systematic scholarly study. What we do know about this $10 billion subsector of the economy comes from anecdotes, advertisements, promotions, and the “fugitive” literature of trade publications. Inevitably, this information is ad hoc in nature — dealing with a particular beauty trend at a specific point in time. Thus, we know very little about how cosmetic fashions fit into a broader societal context and how such fashions wax and wane with the tides of social change. In an effort to provide some insight regarding the interface between the cosmetics industry and the larger society, the present analysis focuses on the lifecycle of a once essential part of a woman’s makeup portfolio — the decorative compact. Assuming a wide variety of elaborate shapes, ranging from miniature baby carriages to Bowie knives, compacts first arrived on the fashion scene in the early 1900s, reached a crescendo of creativity in the 20s and 30s, and quietly passed out of day-to-day existence by the mid-1950s. Now relegated to display cases in antique shops or the dresser drawer of our grandmothers, decorative compacts reflect a storied era between the wars when personal items were really made of metal and had the look of craft about them. Indeed, for women of the first half of the twentieth century, the style of a compact was just as important as the face powder and lipstick that it housed. At one time, virtually every woman in America had at least one compact and wanted it to be what Harper’s Bazaar July 1934 edition called, “The kind of compact you can pull out and make great show of at the dinner table.” What happened to the item the 1928 Sears and Roebuck catalog referred to as the “Modern Essential”? How did an item so integral to the daily personal life of women pass from favor? In essence, a confluence of social, psychological, and technical trends led to a sea change in (A) how society views beauty, (B) the role of women in a post-industrial economy and, (C) how plastic packaging influenced consumption. Studying the emergence, evolution, and demise of the decorative compact provides an opportunity to assess how the broad sweep of social change impacts even the most mundane aspects of daily life. As Roseann Ettinger reminds us in Compacts and Smoking Accessories, compacts were born in the Edwardian era, a time when makeup was still controversial, so powder cases were disguised as a component of more socially acceptable accessories, such as walking sticks, hatpins, or necklaces. Beginning in 1896, according to R. Gerson in Vintage & Vogue Ladies’ Compacts, mesh handbag manufacturer Whiting & Davis Company of Plainville, Massachusetts, created a case-like lid for its bags that featured compartments for powder, rouge, or combs. These early carrying methods befit the times, states Claire Wilcox in Bags, as “privacy and secrecy became paramount — there was no more showing of female accessories.” Despite the popularity of disguised makeup containers, the compact as a freestanding entity was slow to emerge. Andrea DiNoto states in Art Plastic: Designed for Living that as “women began to enter the work force in greater numbers it became necessary to transform vanity items into portable forms.” Manufacturers were quick to respond to this demand via department stores soliciting urban dwellers and mail-order catalogs servicing rural areas. In 1908, for example, Sears, Roebuck & Co advertised a hinged, silver-plated case that sold for nineteen cents, described as “small enough to carry in the pocketbook.” This small and round housing for face powder, puff, and mirror became known as a compact. From its first formal appearance in 1908, until its unceremonious demise in the mid-1950s, the decorative compact was a veritable shape shifter. 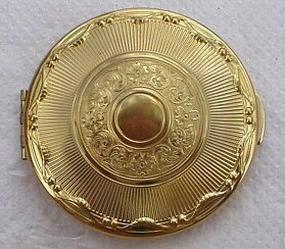 For the majority of the compact’s run as a “must-have” fashion accessory, metal was used because it was readily available, cheap to produce, and could be brushed, enameled, engraved, and painted. Ettinger notes that sterling silver was extremely popular, as was brass, aluminum, gunmetal, nickel, and gilt. Early metal models by industry leaders such as Evans and Elgin American featured ringed finger-chains or longer tango chains complete with lipstick holders; these appendages made the compact easy to carry and called for its design to be carefully considered, as the item was not tucked away in a handbag but openly exhibited. According to Gerson, the compacts made at the close of World War I featured shapes, patterns, and motifs that reflect the geometric style of what would become known as the Art Deco movement and reference its various influences. Orientalism, for example, manifested itself in the form of etched bamboo leaves, striking red and black enamel, as well as hand-painted pagodas. Durable metal compacts met the needs of the image-focused, physically mobile, post-World War I woman — whether she was dancing the Charleston, punching a time clock, or traveling in a motorcar. Twenty years after the Sears catalog first introduced a powder carry case, its 1928 edition devoted two pages to the accessory they termed the “Modern Essential.” The compact was just that — essential. How else could American women carry the 4,000 tons of face powder they were consuming yearly? The compacts of the 1920s merged practicality and frivolity. Truly reflections of their time, these compacts were heavily influenced by social and cultural trends. The unearthing of King Tut’s tomb in 1922, according to Lynell Schwartz in Vintage Compacts & Beauty Accessories, spawned a range of sphinx-, pyramid-, and obelisk-shaped compacts inscribed with hieroglyphics and glittering with faux gold. The rage for automobiling called for its own kind of cosmetic containers with compacts being “incorporated in the visor, steering wheel, and on the gear-shift handle for easy access,” Gerson states. The mock naiveté of Gertrude Stein’s Lost Generation is summed up in the stuffed teddy bear compacts produced by Schuco. These childhood-inspired accessories featured a detachable head that housed lipstick and a torso that opened to reveal powder. In 1926, Elijah L. Johnson patented his cosmetic holder (#1,607,985), Gerson tells us, “in the form of a bracelet which will be very convenient for use and will in no manner interfere with a person’s activity.” Bracelets, along with shoe buckles and rings, allowed the 1920s woman to participate in two of her favorite pastimes simultaneously — dancing and applying makeup. Eastman Kodak Trade Circular’s October 1928 issue featured a Vanity Kodak Ensemble with a large mirror, camera, lipstick tube, and a powder and rouge compact made by popular cosmetic manufacturer Richard Hudnut. As the Jazz Age came to a close and the Great Depression loomed, the compact had become an integral part of American popular culture. By the early 1930s, the compact’s position of importance subjected its design to the influence of America’s emerging aesthetic, Wilcox observes, “an interpretation of Art Deco that excluded the romantic figuration of European Art Deco…leaving only the abstract, uncluttered, and aerodynamic.” To briefly escape their economic woes, Americans flocked to the movies. Hollywood starlets served as dictators of fashion, rather than the dance-hall girls of the previous decade, and, according to Charles Goodrum and Helen Dalrymple in Advertising in America: The First 200 Years, “very quickly, the advertisers found that it was easier to follow the images of the most successful movie stars than to try to show the customers how they should look.” In an era when glamour reigned, a woman used her compact as both a testament to her sophistication and a personal calling card. Sleek, small compacts soon made their clunky older sisters appear clumsy and cumbersome. As the cases became smaller with each passing year, Schwartz notes,they also became more and more intricate in design. "MULTIPURPOSE AS A MARKETING CONCEPT"
It was the concept of a truly multipurpose compact, however, that continually appealed to women throughout the accessory’s more decorative phases and accounted for many of its most enduring forms. Ettinger notes, “Working watches were set right into the tops of square compacts while round compacts were made to resemble pocket watches,” and Linda Balcerak tells us that a cigarette manufacturer, offered smokers a combination compact/cigarette case that included makeup and a lighter. The cigarette case and the compact were logical cohorts. By the 1930s, applying makeup and cigarette smoking were socially acceptable and chic. Both items spoke to the establishment of women as a viable consumer market and independent decisions makers. In the span of two decades, the compact had assumed the shape of everything from baseballs and badminton racquets to playing cards and powder kegs. In doing so, the decorative compact evolved from a practical package for face powder to a personalized fashion accessory. Compacts took the form, Ettinger tells us, of “praying hands, guitars, pianos, books, fans, suitcases, hats, hearts, hand mirrors, cameras, horseshoes, crowns and animals.” One popular compact resembled a telephone dial and was engraved with a woman’s telephone number — just in case it slipped her mind. Compacts could be commemorative; the world’s fairs in Chicago in 1933 and New York in 1939 sold souvenir compacts. Schwartz states that he latter featured compacts made by industry leaders such as Elgin American and Zell, who created a representation of the Fair’s Administration Building. Those visiting Paris could pick up a commemorative compact for personal use or as gifts for friends at home. Every tourist destination from Texas to Thailand sold souvenir compacts during the 1930s and 1940s. By the early 1950, the decorative compact had turned from an essential fashion accessory into cosmetic packaging that was designed to be discarded. The growth of the plastics industry is, to a large degree, at the heart of the shift. Paradoxically, plastic is also the reason the compact achieved so many incarnations during the 1940s. Wartime rationing calling for plastic to replace metal and glass as packaging materials and production of plastic skyrocketed. Cosmetic companies found it necessary to change to plastic and cardboard packaging because of such restrictions. Between 1940 and 1945 alone, Jeffrey Meikle points out in American Plastic: A Cultural History, annual production of synthetic materials in the US tripled. With plastic emerging as the material of choice for decorative compacts in the early- to mid- 1940s, the landscape of cosmetic packaging changed radically — and permanently. Interestingly, many of the first compacts were made of plastics. Celluloid, for example, could be carved, created in various colors, and set with faux gems. Lightweight and versatile, celluloid became a material of choice for the early compact, and its cousin, the cylinder-shaped vanity, which featured a rope carrying cord and decorative tassel. Making celluloid, however, was a multi-step process including various phases of submersion and drying. “Strips thick enough to make compacts had to stay in the drying chamber for about six months,” Schwartz explains. Once the parts of the compact were assembled using various chemicals, it had to be decorated. As with horn, ivory, and wood, it was necessary to shape celluloid by hand. While the material was cheap to produce and labor was not particularly expensive, celluloid compacts were impossible to mass produce, relegating them to an upscale market. When the masses demanded compacts, metal was used to fit the bill. Beginning in the late 1920s, DiNoto observes, innovations in plastic material such as acrylic, polystyrene, vinyl and cellulose acetate made plastic relatively easy to produce economically, especially in light of the new molding techniques imported from Germany between the wars. From 1930-1950, a flood of new materials hit the market. An early plastics directory published in 1929 listed eighty-four trade names. A similar list that appears to have been edited was published in 1939, Meikle states, and included nearly 250 trade names. Injection molding of these new materials soon replaced the compression molding — and its associated plastics — of the past. According to Meikle, compression molding calls for a mold to be heated and cooled with each object produced; injection molding, however, uses a hot cylinder and a cold mold, enabling mechanized mass production. Wartime made great use of these new materials and molding methods. Acrylic, for example, was used for bomber noses, and Plexiglas was used for their windshields. At home, Americans were becoming exposed to the now mass-produced plastics, which were touted as modern marvels. Harper’s Bazaar November 1945 edition writes, “All the old and beautifully built metal compacts are to be had once again, plus new ones in the hardy, handsome plastics developed by war.” Plastics’ importance in the war effort was a selling point for manufacturers. Industry leader Volupté, for example, ran advertisements in 1942 for plastic compacts that read, “And it’s thrilling to know that the Volupté precision tools which fashioned this, are busily working on intricate parts for defense.” The 1940s not only saw consumers warming up to the trend of plastic, but completely buying into the advertiser-crafted hype that these materials were innovative and durable — virtual symbols of American ingenuity and independence. How this new wave of materials, production methods, and public acceptance manifested itself into decorative compacts is visually apparent in the objects themselves. Compacts from the 1920s and 1930s were, for the most part, made of metal. The few that have plastic use it as a design element upon a metal base. According to Juliette Edwards in Powder Compacts, any parts, such as the powder dispenser or hinges, needed to be metal because early plastics were too brittle to take the repetitive stress of opening and closing. By the 1940s, the compact received a total makeover once plastic could be easily molded and quickly produced in an array of colors, designs, and patterns. The availability of new materials resulted in a wave of new products into the market. While many of the designs from the previous decades were still popular, moldable plastics made achieving the shapes much easier and less time consuming. Plastic was also able to duplicate the look of more expensive, hand-worked techniques such as enameling. During the 1940s, metal and plastic compacts peacefully co-existed; many examples integrated both materials into their design. In a gift guide from Harper’s Bazaar November 1947 edition, for example, editors offered up a $1,100 gold compact on the very same page as a plastic one for $7.50. It must be noted that a compact made of plastic did not relegate the object to a less desirable position in the eyes of the consumer, as the public did not yet associate the material with being disposable. Roger and Gallet’s acrylic compact of 1946 featured a separately molded sunburst medallion that was hand-painted and delicately attached to the base with tiny nails. The incredibly popular hand-mirror shaped Trio-ette compact made by the House of Platé was made of molded Tenite and featured a hand-painted rose cameo. It offered a lipstick hidden in the mirror’s handle and powder and rouge in the body of the mirror. The combination sold for $5.50 in the mid- 1940s — the same price point as a traditional metal compact. It was only as the public became familiar with how cheaply plastic could be produced that the idea of disposability took shape in the popular mindset. By the early 1950s, advertisements for obviously disposable compacts began to dominate the pages of women’s magazines. Ads for compact manufacturers such as Rex and Wadsworth were replaced with ads for cosmetic manufacturers such as Revlon and Helena Rubinstein. In the span of a decade, compacts that were once inscribed with a woman’s name were now emblazoned with a manufacturer’s moniker or logo, or — for generic adaptability — a faux monogram that was too abstract to be aptly identified. The very plastics that were lauded as long lasting during the 1940s were considered disposable by the mid-1950s. DiNoto tells us that plastic packaging for cosmetics was unusual until the early fifties but soon became the norm. Indeed, by the next decade, Meikle states, plastic packaging designed to be disposable accounted for 20 percent of the total plastic production in the United States. “Use and Lose” had become the motto of the American consumer. The demise of the decorative compact cannot be attributed solely to the growth of plastic packaging. More likely, it is the synergy between the boom in the plastics industry and the changes in an increasingly sophisticated cosmetics market that silently sealed the fate of what is now regarded as a quaint beauty accessory. For the first time in history, cosmetics were being mass-produced and purchased by a wider range of women than ever before. By 1948, Peiss notes, 80 to 90 percent of American women wore lipstick, two out of three wore blush, and a quarter wore eye makeup. As the middle class became more affluent, traveled more to exotic places, and played more in the sun, the visual aesthetic changed. The sun-kissed tans of jet-setting Americans and California beach babes made the porcelain-white skin of a previous generation seem outdated. Dewy, glowing skin was a sign of health and vigor — attributes the American woman now tried to project. By the 1950s, cosmetic options available to the American consumer seemed limitless. The three or four shades of loose powder from which the flapper had to choose were a far cry from the multiplicity of makeup options on the market by mid-century. In the first two years of the 1950s, De Castelbajac states, cosmetic retail sales jumped from an impressive $400 million to over a billion dollars. Face powder, once a solo player, had become merely a member of the chorus. In the course of twenty years, women went from needing a simple container for their lipstick and powder to needing a makeup bag to hold mascara, eyeliner, lip liner, and eye shadow. As the post-war era evolved, women’s psychological approach to makeup changed. The flurry of excitement a woman could create by whipping out her compact in 1924 didn’t hold the same intrigue in 1954. In fact, women were less and less interested in displaying their use of cosmetics. The newly liberated flapper flaunted her compact with pride, but Park Avenue advertising firms convinced the housewife of the 1950s that an image of indelibility — a permanent prettiness — was the modern way and required a more private application ritual. Specifically, beauty advertisement jargon began to emphasize indelibility and the image of permanence with phrases such as “long lasting” and “kiss-proof.” The modern woman would seem old-fashioned to have to reapply in public. Finally, according to Angeloglou, the natural, “no-makeup” trend of the late 1950s and 1960s allowed a generation to become even less familiar with applying face powder. The multibillion-dollar cosmetics industry provides a useful vehicle for understanding how broad social trends impact everyday life. Clearly, the vagaries of the beauty industry are at least partly determined by the socioeconomic and cultural shifts taking place in the larger society. The decorative compact, once a “never leave home without,” fell victim to changes in the social definition of beauty, modifications in the self-image of women, and the onslaught of disposable plastic packaging. By understanding the societal factors behind the rise and fall of such everyday implements as the decorative compact, we come to better grips with our understanding of social change. Too often, such broad concepts remain far up the ladder of abstraction and are reserved for academic discourse. But social change, for all its macro characteristics, affects the daily life of people in the real world. And the more we understand that daily life, the more we are able to assess the impact of broader societal trends on individual behavior.